Ok, so I understand in great detail the main page, now can I start? WHAT? You haven't even made an account and logged in! You have to do that first! As it suggests, you should read through the manual to get a better understanding of the three tribes, but since I'm planning to explain that to you soon, don't worry about that. First, lets concentrate on the task at hand. STEP 1 : Come up with a nickname. As simple as it sounds, sometimes it can be difficult. I prefer original and interesting names, while others love to copy those whose talents in name giving surpasses their own. Whatever name you choose for your new account, just make sure it is appropriate for young children to view. STEP 2 : Submit your email address. I don't really have anything to say about this one, since there is not much to say. If you do not have an email address, you can receive one for free from Yahoo, Hotmail, or Gmail. All of these are good and well trusted. STEP 3 : Create a password for your account. Although this is a simple task, I have a few suggestions. Always try to come up with hard passwords. Never use your birthday or any part of your name, and always try to randomize it. Choosing numbers and letters in no real order is a good way to ensure extra security. Just remember to write it down, so that you don't forget it. STEP 4 : Choosing a tribe. There are three tribes to choose from, each with there own advantages and weaknesses. As a beginner I think it would be wise to choose one that would best suit your needs, which are to gain lots of resources and not be conquered. As such, the Gauls, who not only hide twice as many resources in their crannies (explained later) but also have the best defence, would be a good choice. If you were more leaned toward killing and pillaging, then the Teutons would be the tribe for you. They not only have the best offensive, but they also can loot from crannies, so that the crannies only hide 80% of what what they are supposed to. So if you attack someone with a cranny size that holds 300 resources (that's of each type, 300 wood 300 wheat 300 clay 300 iron, so a total of 1200 resources hidden) that would mean that the crannies only really hide 240 resources when you raid them. I think most people, however, would lean towards the Romans, who are the most balanced of the three tribes. They have equal defence and offence, and they can also build two buildings at once, a resource building and a building in your village. Just go up to the first topic and look there for a more in detail description. STEP 5 : Choose a starting position. I don't think your starting position really matters. The fact is, no matter where you land in the game, someone is always going to raid you, so what does it matter? If you truly want an input in where to go, I would suggest south west, just because that would land you in the negatives, and there is something cool about being in the negatives. STEP 6 : Read and accept the game rules as well as the terms and conditions. It is highly recommended that you actually read the rules before clicking the little box as it is saying you agree to everything within them. Additionally you can subscribe for getting informed about interesting news and game related information. 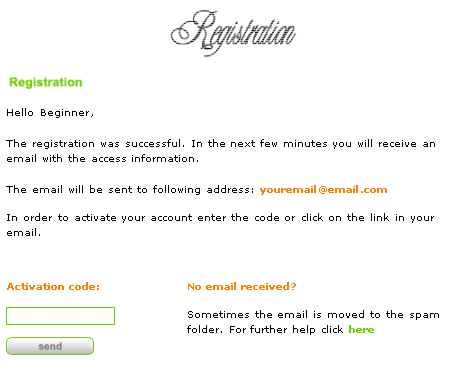 STEP 7 : Click register. This may be the most simple step of all. Click the box that says register. 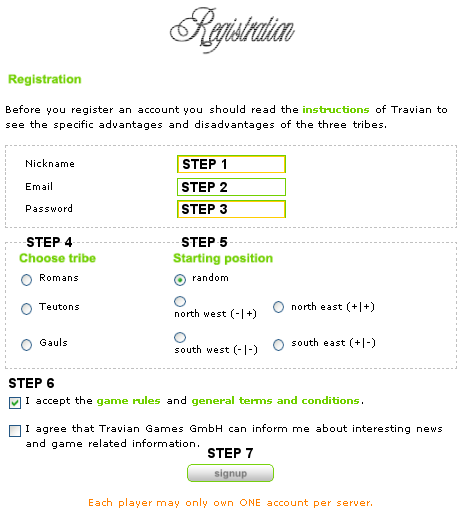 Step 7 will take you to Activation page, where it will welcome you to Travian and also tell you it sent an email to your email address. All you have to do is open up a new page, go to your email and open the message, then copy the code and paste it in the little box under activation code. Then press OK. If you look in your email and do not see the message, first look in the bulk section of your email account, and then go back to the activation page and click the green here. It will take you to another page, and give you instructions to get your activation code. Your account has been successfully activated! Click here to 'log in' The first time you come to this page, it will be blank, but the second time, if you leave 'remember me' selected, it will have the information already placed in. Just type in your account name and password and press login. Its so simple, you could have done it without instructions, but I provided them anyway! I will now shortly explain the menu on the left side of your account as this is different from the home page menu. (red): This is the side bar. It appears on every page in Travian. On the side bar are several links to different pages in Travian. 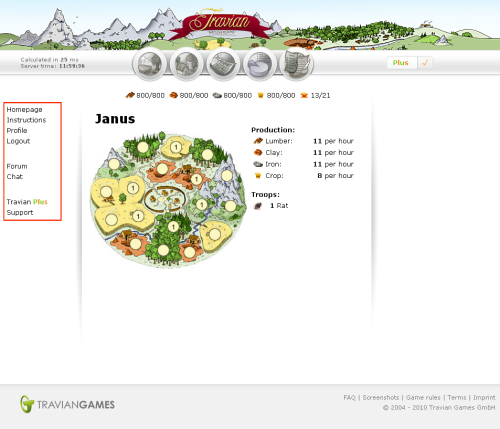 This is a link to the main page of Travian. This brings you to a live chat room, where you can get your help fast and easy. This page tell you a little information whom you have to contact for which issues and how you can do this.